Last autumn I visited Tuscany in Italy with the concrete intention to photograph the attractive landscape with its cypress groups. 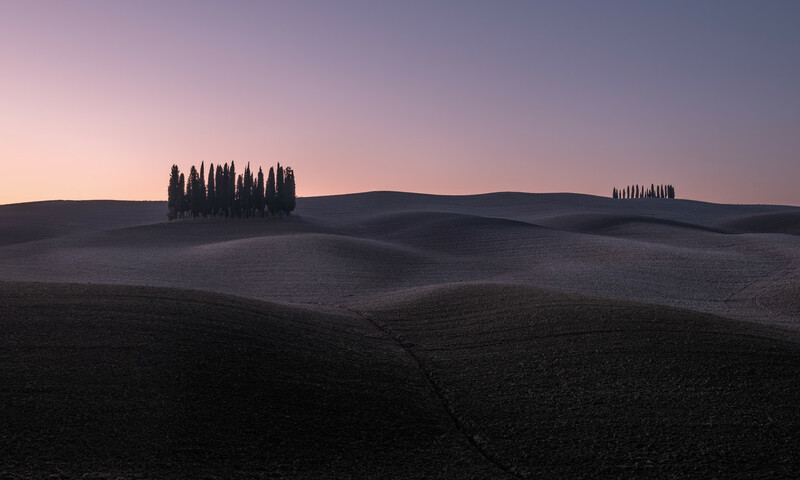 The picture was taken in Val D'Orcia, a valley that is part of the agricultural hinterland of Siena. The striking aesthetics of the landscape with its flat plains, from which almost conical hills rise, inspired many artists of the Renaissance. Through research, I found out where this classic Tuscan landscape is located. I have chosen a spot from which the hills look harmonious, do not overlap, a path that gives depth to the picture and the cypress groups make a reputation possible. I walked a lot up and down the hills and finally made the picture of a slight hill. I went to the same location several times early in the morning, with the hope to get a cloudless morning sky with a soft morning glow. On the third morning, the sky and the morning colours were as I had hoped, birds sounded and it was quiet and wonderful. A perfect moment to get the shot. I did not do much post-processing. A little more clarity, cropping and brightening the picture. I made the similar picture with the analog large format camera at lunchtime in monochrome with a completely different character.